HPSC Online Form 2018 - Apply Online for 166 Posts: Haryana Public Service Commission(HPSC) has released the post of H.C.S.(Ex. Br. ), D.S.P, E.T.O, District Food & Supplies Controller, 'A' Class Tehsildar and other Various Posts in various departments. Age Relaxation: For Age relaxation please refer the notifications. 1. Candidates must possess the Bachelor Degree in Art/Commerce/Science from a recognized university. 2. Knowledge of Hindi/Sanskrit upto Matric Standard or Higher education. 3. Please read official notification before applying. 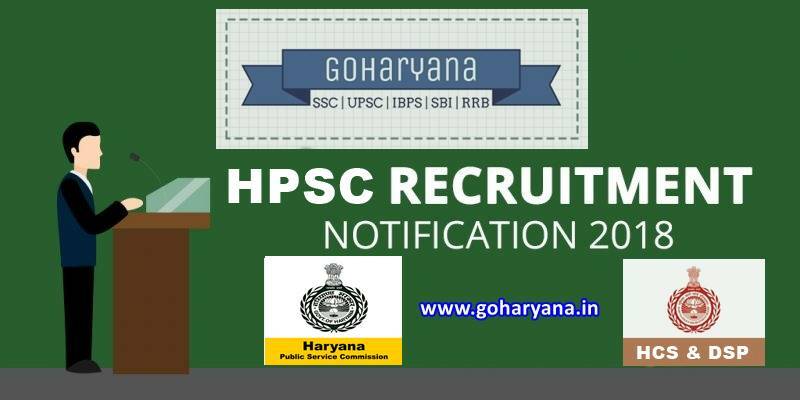 How To Apply: Interested & Eligible Candidates can apply online through www.hpsconline.in from 01-08-2018 to 04-09-2018. 2. Click on "Read and Continue". 3. Select Name of Post from Drop-Down Menu and click on Continue. 4. Fill all Details Carefully and Upload Photo & signature & Click to Proceed. 5. After this Fill Full Details and Submit Form. Last Date to Apply Online - 04/09/2018 upto 17:00 Hrs. Last date for payment of fee - 04/09/2018 Upto 24:00 Hrs. Note:- Interested Candidates can read the full notification & Instruction before apply online. Notification & Instruction link given above.